The Main Mall renovations on Glasnevin Campus are hoped be finished for September 2019, according to the Office of the Chief Operations Officer. The space between the front of the Henry Grattan building and the Labyrinth will be replaced by a large open plaza to compliment the new Student Union that opened at the start of October 2018. 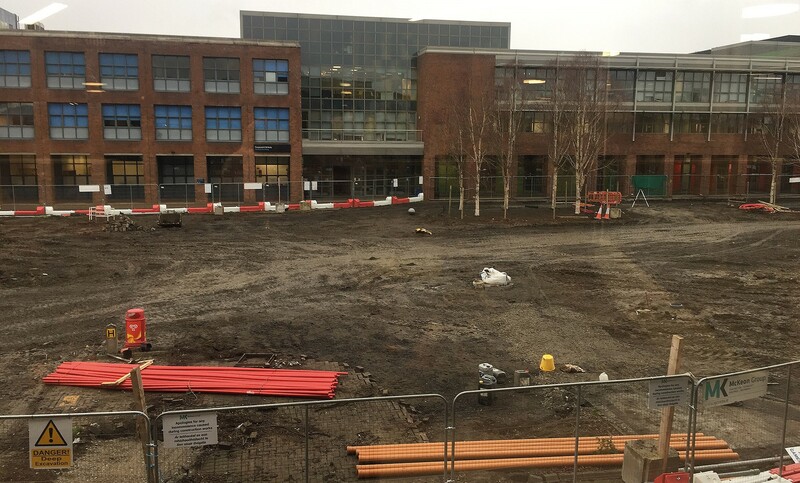 Construction on the green began last November and has caused some disturbances on the Glasnevin campus. “Living on a construction site all the time and working on a construction site brings its challenges, but I suppose if DCU wants to rapidly evolve and rapidly grow, construction is something that will come hand in hand with that,” said DCU Students’ Union President Vito Moloney Burke. The plans include new seating areas and sustainable open spaces. There will be over 125 native semi-mature trees planted and 2,000 metres squared of new shrubs and grass planted in the space, which will be around four times the size of a basketball court. Over 9,000 square metres of public space will be refurbished as part of the University’s Campus Development Plan 2016-2021. The Business School Square and the South Access Road will also be refurbished. The Ballymun Entrance Avenue will be improved to provide pedestrian access to the U building, Sports Centre and Student Residences. “Realistically there will always be something happening in DCU. There will never be time where there is no construction happening on campus and that’s a positive in my eyes,” said Burke. DCU announced its €230m capital development plan in April 2016 which includes transformation on all campuses. The work included improvements on the F Block on St Patrick’s Campus and the Stokes Building Extension on Glasnevin. A Future Tech building for STEM students and new student residences are both at the design stage. Funds for the plan came from the Ireland Strategic Investment Fund and the European Investment Bank.